I love this photograph. An amazing creation surrounds created man. I do not infer man as a gender but as the all encompassing creation of mankind, male and female alike, created in God’s image. “God said, Let Us [Father, Son, and Holy Spirit] make mankind in Our image, after Our likeness, and let them have complete authority over the fish of the sea, the birds of the air, the [tame] beasts, and over all of the earth, and over everything that creeps upon the earth. So God created man in His own image, in the image and likeness of God He created him; male and female He created them.” Gen 1:26-27 Amp. 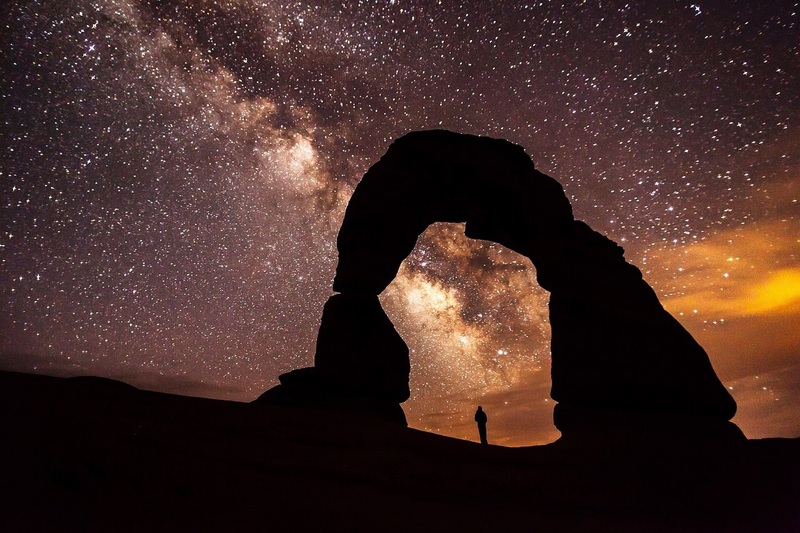 The reason I love this photograph is because the vastness of the night sky, so beautiful to observe, helps put mankind in perspective to God’s realm. When I look upward at night, I’m reminded just how small I am in the whole scope of life. We often forget our true place in God’s creation. Depending on what is happening in my life, I can erroneously become full of myself and attempt to rule not only my own circumstances but also those of others around me. When tuned into God and His plans, the Holy Spirit quite capably brings me back, through corrections, to my proper place as represented by this photograph. The interesting thing to ponder is that this night sky representation shows the vastness of God’s reach. We catch glimpses of it on clear nights. We can be set into absolute awe as we correctly realize our true place in God’s economy. We will go to bed after such observations with a peace that God is in control and all is well in our world. And then something happens when we wake in the morning. A new day dawns, bright and clear, and off we go into our life. If you’re anything like me, it may not be long before I enter into the circumstances of my life, forgetting that God has His ways — and I have mine. I can easily fall prey to taking back control of my life as the onslaught of issues in this complicated world present themselves to me. You see, the truth of life is that if I were to look up in the day hours, I wouldn’t see that beautiful heavenscape I witnessed the night before. It seemingly vanishes from sight with the light of day. Truth is though it is still there, just hidden from my seeing at the moment. The same is true of the spiritual realms. They are with us, always, however they are not easily seen. God can anoint us to see into the spiritual realms and I believe He loves to open our eyes to this potential. But, in order to see spiritual realms, we must first realize and acknowledge they are there! Just because we can’t see them clearly, doesn’t mean they don’t exist. God is a mystery, too glorious to comprehend. But as He grows and matures us in our faith, more is revealed. And if we are actively seeking Him (His heart’s desire), I believe He is overjoyed to reveal to us more and more of His economy. I want to invite you today to join with me in asking Papa God to anoint our eyes to “see” His spiritual world. Perhaps for the first time or possibly in a renewed look, let’s turn our eyes heavenward and ask that He reveal more of His ways to us. In this way, we open ourselves and give permission to Papa to allow us to take part in more of His mysterious ways. Would you agree with me that catching a glimpse of His creative and blessed space in daytime would be a most welcome sight? Who knows what He might choose to show you…perhaps He longs to give you an answer to the question you’ve been asking Him for a long time now. Moses turned aside to observe the burning bush (Exo 3:3-4). That singular act, separated Moses from the rest and God chose to show him (Moses) His glory. Let’s turn aside today, shall we? Lord, we long for more of You and we long to see Your spiritual realms. I believe there is something You desire to show each one of us this day. Help us Lord to see. P.S. Take a look at the photograph again. God just gave me a glimpse of His hands in that rock! Holding us in His hands, protecting His creation in love. Ahhh. Thank you Lord.